So if you can't tell, pregnancy hormones are really beginning to get the better of me. The other day I watched an episode of Jon and Kate plus 8 and they went to the Outer Banks...it made me cry. Because I want to go to the Outer Banks. And they were in Coralla! I sat there, again with tears in my eyes, and told Sam "that's were Mommy and Daddy got married" sniff, sob, sniff. "One day, we'll take you and your little brother there." sniff sniff. I actually looked up the house were we got married to see if it was still renting...and also if it had the same name. When those houses get sold, people usually change the name from "Sandy Paws" to "Life's a Beach"...to personalize the cheesiness. Our house was called "A Joy Forever"...appropriate for a wedding, no? Well, it's still there. AND if you can get it for the week of October 18th for $2500!!! The house sleeps 27 people..not a bad deal. Sure, I'll be in labor that week (hopefully) but I couldn't help but think of pushing that reserve button and send out a mass email titled "Meet me in OBX! "....but life is much more complicated than that now, isn't it. I still pledge to go on our 10th anniversary. 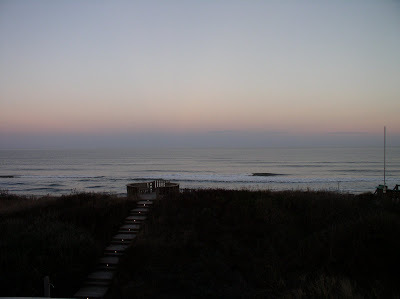 So meet me in the Outer Banks...2011! I just spent the last hour fighting back tears, rocking back and forth while repeating the mantra "don't think about it, don't think about it, don't think about it"...which of course, just makes me think about it. There was a time before Sam was born and then directly after he was born that I shunned cnn.com. Wouldn't go there. If you are a regular you know that there is always at least one "mutilated puppy" or "2 year old killed by escalator" story. No, it's not news of national importance. It's sensational, tug at the heart strings, make you feel crappy kind of news. Its emotional sabotage. On a normal day these images and stories would be upsetting, but add the onslaught of hormones I am currently enjoying, you get a panic attack. But I learned this, so if I do go to cnn.com, I don't click on anything like that. Sure, the headlines are scary, but at least without the details the crippling empathy and horror can be kept at bay. I won't tell you what the story was about...but the headline did not give enough information for me to know what was waiting for me on the other side of that click. In fact, I completely misinterpreted the headline. I thought I was going to read about a kid playing in a puddle or swimming with ducks or invented some new water toy... Needless to say that was not the case, and in hindsight I should have realized, but I am still trying to recover from the imagery and tragedy that unfolded. It makes me mad. I'm not talking about censorship, but jesus! give a pregnant mother of a 20 month old a chance to protect what little emotional fortitude she has left. At least use a word like "death" or "tragedy" or for heaven's sake "sad" or something! So, we'll be without internet for a while during our move back to the construction zone. I'm looking forward to being home, but I'm not exactly sure what it's going to be like with all the activity that is still going on. Just so you know where I am. Not that I'm writing up a storm over here, but it will probably be quiet here for a bit. Excuse me while I bat away cobwebs from this blog. Sam has become a very defiant little boy. I am telling myself this is a phase, it's the age, "it's good that he's so independent" ect, ect. But seriously the kid has found my buttons and boy does he like to push em! His new adorable behavior is spitting. He takes a swig of water, walks over under the table, or to the chair...leans over and spits it into a big puddle. He proceeds to smear it everywhere. How precious. Argh. And once I take the drink away, he does the same thing with his actual spit. Gross. And whenever I try to be stern mommy, he laughs at me. HE LAUGHS AT ME. Which, of course, doesn't make me happy. And don't even get me started on how he is treating Tubbs. Poor Tubbs. But in the big scheme of things, he's a pretty great kid. I know every child has his issues...and what seem like flaws or problems can reveal themselves to be assets. And me being gigantic doesn't help. I can't react as quick to misbehavior as I used to, except verbally. And I don't like to yell...oh,I'm not perfect, I yell...but I don't like it. And it doesn't work anyway. Sam ignores most verbal directions...well at least when it's in the order of "Sam, stop doing that." Suddenly, he's deaf. And the kid bolts. LIke runs. Away. In public. Near traffic. WITH GLEE AND GIGGLES. So there, end of rant. One day I will write a blog post counting all the blessings of my adorable, precious little boy. But on those days, I just bask in the perfection and cuteness. I need to express more gratitude for my life. I'll work on that. Because I am grateful. But sometimes you need to purge the ick to appreciate the magic. Update: After posting this, I was poking around the internet and one of the bloggers I regularly read had posted this. Thanks internet.